Already an established painter in Venice by the age of 21, Giovanni Battista (Giambattista) Tiepolo (1696-1770) was influenced by Piazzetta, but he soon developed his own artistic style. This was marked by the impressive perspectival views of his compositions, the brilliance of his colour, and the expressiveness of his figures. Tracing the progression of his work from the sketch to the finished fresco, his technique and the large surfaces involved make the execution of his paintings look deceptively easy. Tiepolo's ceilings and wall frescos are unrivalled and demonstrate to perfection the artist's unique imaginative skill, virtuosity in the application of paint, and sensitive approach in his choice of subject matter. Later, Tiepolo also produced superb easel paintings in oils, his portraits being particularly tine. He left a legacy of lively caricatures, drawings, and etchings. great Italian painter of the 18th century. His luminous, poetic frescoes (e.g., “The Banquet of Anthony and Cleopatra,” before 1750), while extending the tradition of Baroque ceiling decoration, epitomize the lightness and elegance of the Rococo period. Tiepolo's father, who had been engaged in the shipping business, died in 1697, leaving his wife and five children in comfortable circumstances. His mother entrusted Giambattista to Gregorio Lazzarini, a painter of decorative, academic taste, who taught his young pupil the basic techniques of his profession. Tiepolo was drawn to a melancholic style with strong contrasts of light and shade, orchiaroscuro. Such strong shadings of light and dark, coupled with a genuine dramatic feeling, may be seen in his first public work, “The Sacrifice of Isaac” (1716), for the church of Sta. Maria dei Derelitti, or Ospedaletto. Tiepolo's name first appears on the lists of the Venetian painters' guild as an independent painter in 1717. The fact that his studio was thriving at this time is attested by his marriage to Cecilia Guardi, the sister of the painters Giovanni Antonio and Francesco. During this period, Tiepolo was influenced by the robust plastic modelling of his Venetian contemporary Giovanni Battista Piazzetta, as in such works as the monumental “Madonna of Carmelo and the Souls of Purgatory” (c. 1720). His artistic education, however, was complex and varied: he examined the works of both Venetian and foreign contemporaries and studied older painters as well, as demonstrated by his large production of etchings after 16th-century subjects. Through his intense artistic activity, Tiepolo mastered a wide variety of forms and moods, ranging from the drama of such works as “The Crucifixion” (1723–24), in the oratory of Sta. Barbara Burano, to the narrative humour of the four mythological scenes now in the galleries of the Accademia in Venice. It seems unlikely that the young Tiepolo left Venice, and therefore he did not see the great decorative cycles that other Venetian painters were executing throughout Europe. Nevertheless, he understood their methods. His maturity of technique and originality of formal invention were already evident in his first frescoes, the “Glory of St. Theresa” in the church of the Scalzi and “The Force of Eloquence” on the ceiling of the Palazzo Sandi-Porto (now Cipollato). It was not, however, until the frescoes of the Palazzo Arcivescovile of Udine, executed sometime after 1726, that Tiepolo, then about 30, reached full maturity of expression. In these frescoes, he gave up the chiaroscuro of his early works and greatly brightened his colour, while preserving his form intact. 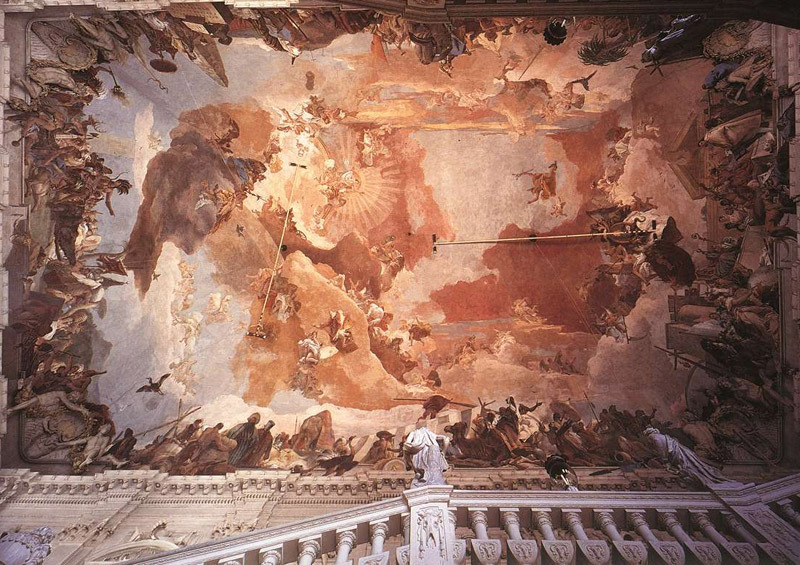 The decoration was commissioned by Dionisio Dolfin, the patriarch of the town of Aquileia, and Tiepolo probably began work with the ceiling above the main staircase, depicting the “Fall of the Rebelling Angels” in vigorous, dramatic forms; in the gallery, within the Baroque perspective framings of Mengozzi Colonna, his faithful collaborator, he narrated biblical episodes of varying complexity, in bright colour and with bold brush play. 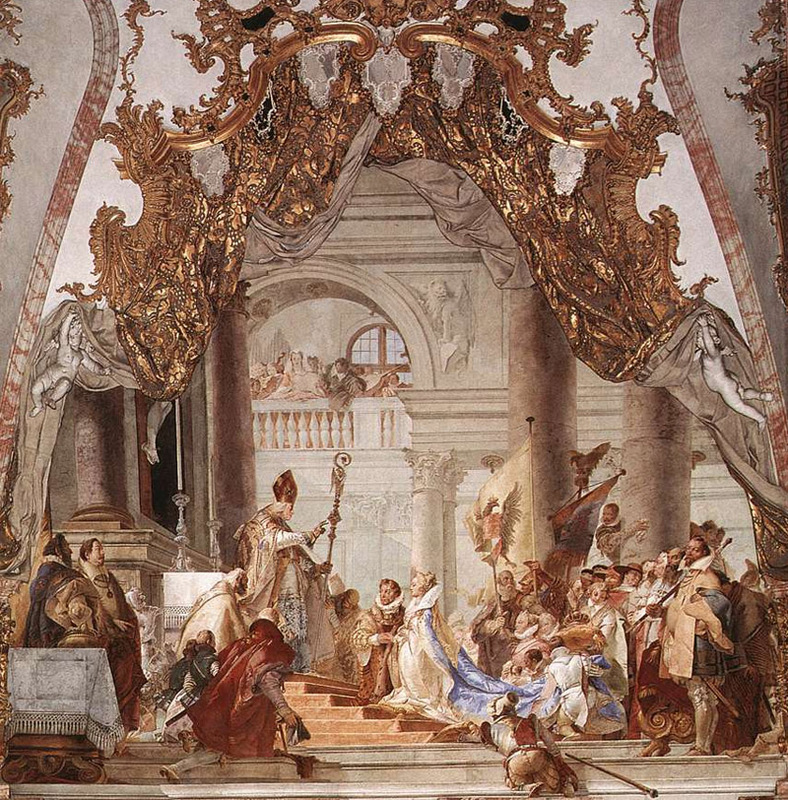 At this same time, or shortly thereafter, in a melodramatic and agitated style, Tiepolo executed for the Dolfin family's Venetian palace 10 scenes of Roman history. The enrichment of his colour during this period became particularly tasteful in his smaller paintings, such as the two versions of “Apelles Painting the Portrait of Campaspe” (Montreal Museum of Fine Arts and the National Gallery, London), both of which are subtle, almost ironic reenactments of the classical episode. By the 1730s, Tiepolo's fame had gone beyond Venice. 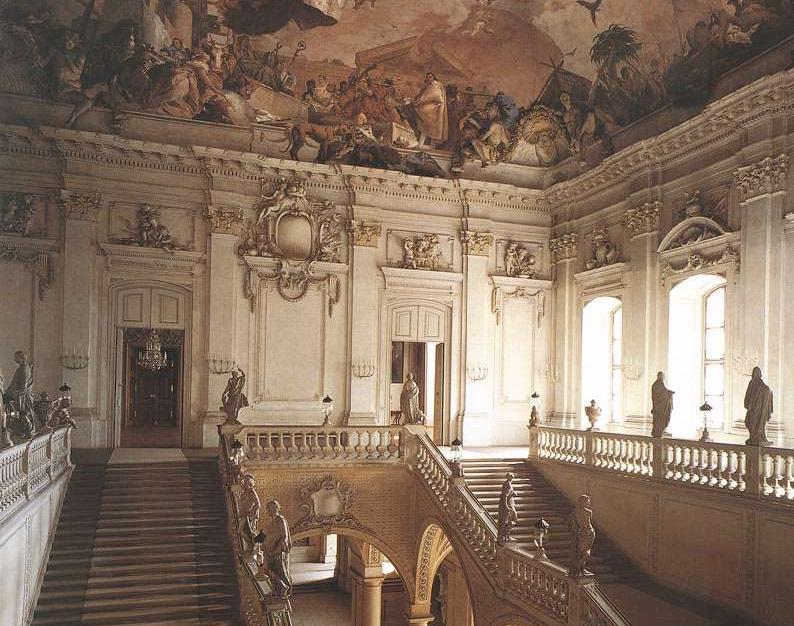 He was called to Milan in 1731, and there he decorated the Palazzo Archinto (destroyed by bombing in World War II) with mythical scenes, of which marvellous small models remain, and the Palazzo Dugnani, for which he painted graceful episodes from history within Baroque settings. In autumn of that same year, he began the decoration of the Cappella Colleoni at Bergamo, depicting stories of John the Baptist (1732), into which he introduced airy landscape backgrounds that marked an innovation in his style. In the fall of 1734, working “day and night without rest,” as he himself put it, Tiepolo decorated the Villa Loschi, now known as Zileri dal Verme, at Biron, near Vicenza, for which he prepared a famous and very beautiful series of drawings. Indeed, Tiepolo was a tireless and prodigious sketcher, capable of suggesting with pen and skillful watercolouring the rapid conception of structures and images that he would later carry out in frescoes and paintings. In 1736, Count Tessin, who had to select a painter to decorate the royal palace in Stockholm, described Tiepolo this way: “full of spirit . . . of infinite fire, dazzling colour, and astonishing speed.” This is a fitting portrait of both the painter and the man. But Tiepolo would not leave the city of Venice, where the nobility and the clergy were by now contending for his work and where he was being praised as “the most famous of the virtuosi.” Rather, he preferred to send his works abroad, as in the case of “The Adoration of the Trinity by Pope Clement” (c. 1735), which was sent to Nymphenburg and is now in the Alte Pinakothek in Munich, or “The Martyrdom of St. Sebastian” (1739), which was sent to the church in Diessen. Sometime toward the end of the 1730s, Tiepolo painted the “Institution of the Rosary” on the large ceiling of the church of the Gesuati (or Sta. Maria del Rosario), at Zattere, covering an enormous amount of space and reviving the triumphal taste of Roman Baroque decoration. In the decade from 1740 to 1750, Tiepolo created works based on secular themes in which he experimented with forms and appearances of the great luminosity that was rediscovered in Venetian painting from 1730 by Piazzetta, Canaletto, and Guardi. During this time he became a close friend of Count Algarotti, an important personality in the international cultural life of the time. Tiepolo's general education had been unpretentious and provincial, but his meeting with Algarotti drew him closer to the classical taste of the time. Nevertheless, the world he depicted in his works of the period on the theme of the tales of Cleopatra (“The Banquet of Cleopatra” [1744; National Gallery of Victoria, Melbourne], two canvases , in Arkhangelskoye, near Moscow, and the fresco complex at the Palazzo Labia in Venice [shortly before 1750]) is a fanciful image of antiquity; formally, this image is derived from the Venetian Renaissance master Veronese and parallels the melodramason classical themes that were popular in the 18th century. 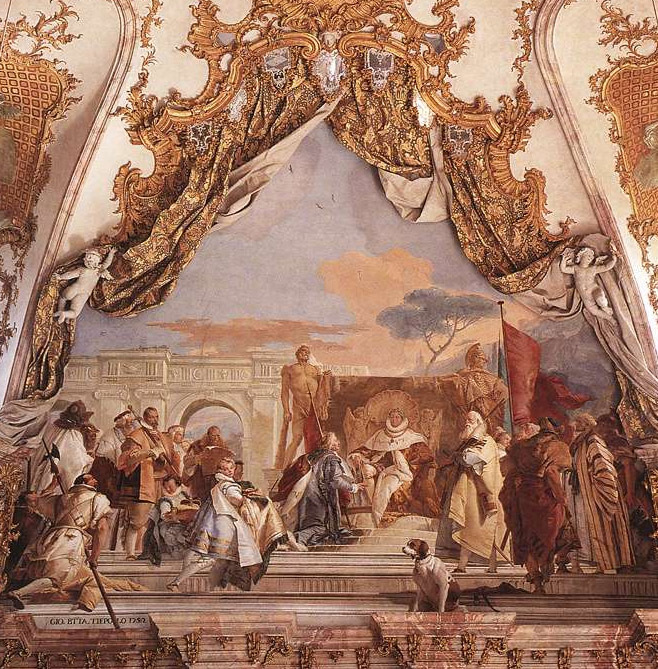 An invitation to decorate some of the rooms of the Residenz in Würzburg came to Tiepolo at one of the happiest moments of his career, in the full maturity of his artistic genius, and he went there in 1750 with his two sons, 23-year-old Giovanni Domenico and 14-year-old Lorenzo. They painted a cycle of frescoes in marvellous accord with the style of Balthasar Neumann, the architect. 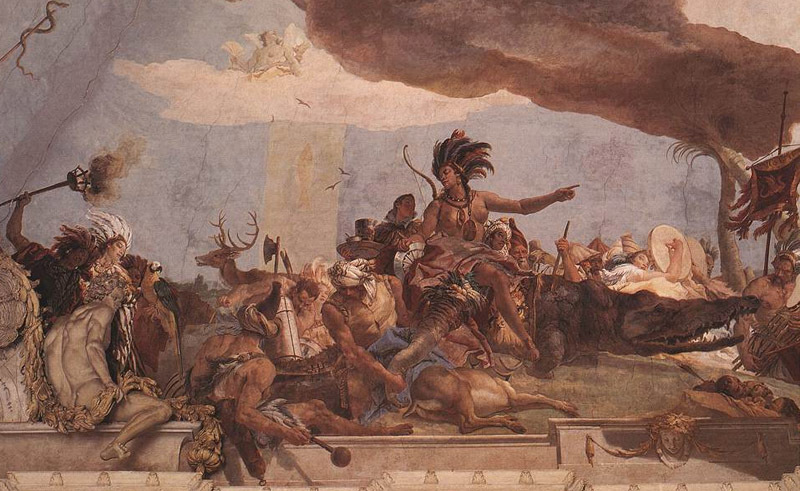 The ceiling of the Kaisersaal, with its “Wedding Allegory,” is the most boldly luminous work of Tiepolo's career (see ). The wall frescoes narrate events of the Middle Ages with a supreme naturalness and a total indifference to history. The “Olympus,” an assemblage of mythological and allegorical representations on the enormous ceiling of the main staircase, has been said to symbolize and exalt the humanistic aspirations of the 18th century. The rhythmic grandeur of these decorative sequences is also reflected in the solemn “Adoration of the Magi” (1753; Alte Pinakothek, Munich). (The influence of Rubens has been seen in these works, and it is possible that Tiepolo's stay in Germany did, indeed, give him the opportunity to become acquainted with artists such as Rubens and Rembrandt, neither of whom was well represented in Venetian collections.) Almost in direct contrast to the grandeur of this official production, the artist pursued an almost romantic, poetic theme, portraying episodes taken from the Italian Renaissance poet Tasso in four magnificent canvases depicting the story of Rinaldo andArmida, now in the Art Institute of Chicago. In their new treatment of landscape and their inclination toward lyric warmth, these canvases are direct precursors of his decoration for Villa Valmarana, near Vicenza (1757), in which the personality of his son Giovanni Domenico asserted itself in exotic rural scenes of carnival season. For the first time since his earliest attempts in 1748–49, Giovanni Domenico achieved something more than his previous depersonalized collaborations with his father and was able to express his own peculiar anecdotal and realistic-grotesque vein. The elder Tiepolo, on the other hand, drew on the poetry of Homer, Virgil, Ariosto, and Tasso to execute a nucleus of feelings ranging between the dramatic and the passionate, on an idyllic but sensually moving plane. This stay on dry land after his close contact with Venice gave him the magnificent new graphic observations documented in the lyrically intense landscape of the great altarpiece he executed for the cathedral of Este in Italy, “St. Tecla Freeing Este from the Plague” (1759). Tiepolo was now on the eve of his departure for Spain, from which he would never return. Before leaving Italy for the last time, he accepted the task of celebrating the last dream of power of a noble Venetian family, the Pisani family, who had built their own belated but splendid Versailles. In Tiepolo's magnificent “Apotheosis of the Pisani Family,” the most attractive section is an array of children's portraits and a frieze of male and female satyrs, which give a stamp of sensual existentialism to the decorative ensemble. Interspersed among his many decorations, Tiepolo painted many portraits. A unique example is the superb portrait of the “Procurator Giovanni Querini (? ),” owned by the Galleria Querini-Stampalia of Venice; it represents not only aman but also an undermined aristocracy destined to fall. Venice's political equilibrium was shattered in 1756 by the Seven Years' War, but Spain remained outside the conflict, and Carlos III invited Tiepolo to Madrid to enhance the gloryof the Spanish monarchy at the Palacio Nacional. Tiepolo arrived in 1762 with his active collaborators, Giovanni Domenico and Lorenzo. In 1764, this team finished the decoration, in which the elder Tiepolo continued to define, and in part carry out, the complex thematic conception of thethree ceilings. Unfortunately, the concepts did not fit in with the architectural environment, and the chromatic vividness of the beautiful sketches was not completely realized in the finished work. Yet, in “The Power of the Spanish Monarchy,” “The Apotheosis of the Spanish Monarchy,” and “Aeneas Ledto the Temple of Venus,” Tiepolo dared to create bold perspective inventions, sustained by rich chromatic orchestration. In contrast to the solemnity that pervaded the Spanish court, Tiepolo presented a poetic art of light and colour, based on an inner feeling of almost romantic melancholy, as may be seen in the religious canvases executed for Aranjuez and in the various sequences of the “Flight into Egypt” executed for private patrons. The ceilingswere Tiepolo's last major undertaking. The hostile attitude of the official Spanish milieu seems to have resounded in the 19th century, when connoisseurs and critics rejected Tiepolo, along with the Baroque and Rococo styles, in general. He was considered an unhealthy and bizarre genius. But the change in taste brought about by Impressionism late in the century prepared the way for the rediscovery of the great Venetian. Generations of critics in Italy and elsewhere have worked to reconstruct his enormous pictorial output and to reassemble his prodigious mass of quick sketches and brilliant etchings. Modern taste accepts him without reservation and without need for either historical perspective or cultural justification. 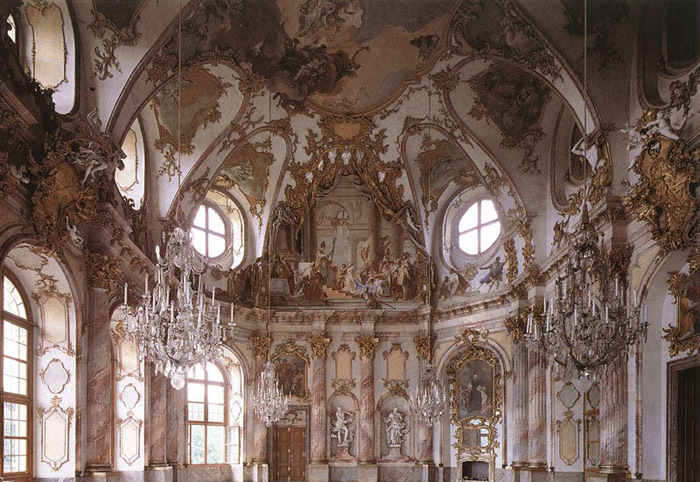 His huge decorative works formed a perfect complement to the Rococo churches and palaces of his time. Described by one of his contemporaries as being “all spirit and fire,” he workedwith astonishing verve, and his output of ceilings, murals, easel compositions and portraits, sketches, and etchings is so huge as to invite the suspicion of superficiality. Yet there is an underlying melancholy in all his best works that gives them a profundity rarely found in other art of his time. Critics now rank him with the great painters of all ages. The Prince-Bishop of Wurzburg, the regional capital of Lower Franconia in Germany, commissioned the Bohemian architect Balthasar Neumann (1687-1753) in 1719 to build him a palace in the centre of the city. Johann Zick was initially engaged in 1749 to paint the Banquet of the Gods and the Goddess Diana at Rest in the reception room, but he was later replaced by Giambattista Tiepolo, who was hired for the decoration of the banqueting room (1750-52), for which statues and ornamental stucco had already been commissioned. The theme of the decoration, chosen by two of the court's Jesuit priests, was inspired by a series of historic episodes that had taken place in the medieval city. One of these, chosen by Tiepolo and his sons Giando-menico and Lorenzo to be portrayed on the walls of the banqueting hall, was the marriage of Frederick Barbarossa to Beatrice of Burgundy, while the ceiling was given over to the great illusionistic scene of Apollo driving the bride to meet the emperor in his chariot. The free and original interpretation of the historical and celebratory theme, and the sumptuous and intense colourist treatment, were greatly admired. 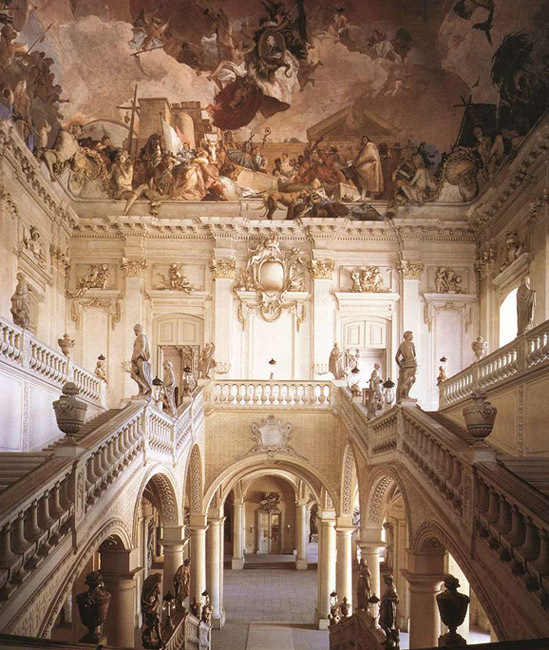 Tiepolo was also commissioned to paint the vast ceiling above the grand staircase, where he summed up the concepts and artistic language that he had first used in 1740 when decorating the Palazzo Clerici in Milan and in his frescos for the Palazzo Labia in Venice. The fresco is a mythologically-inspired narrative, which pays tribute to the Prince-Bishop. 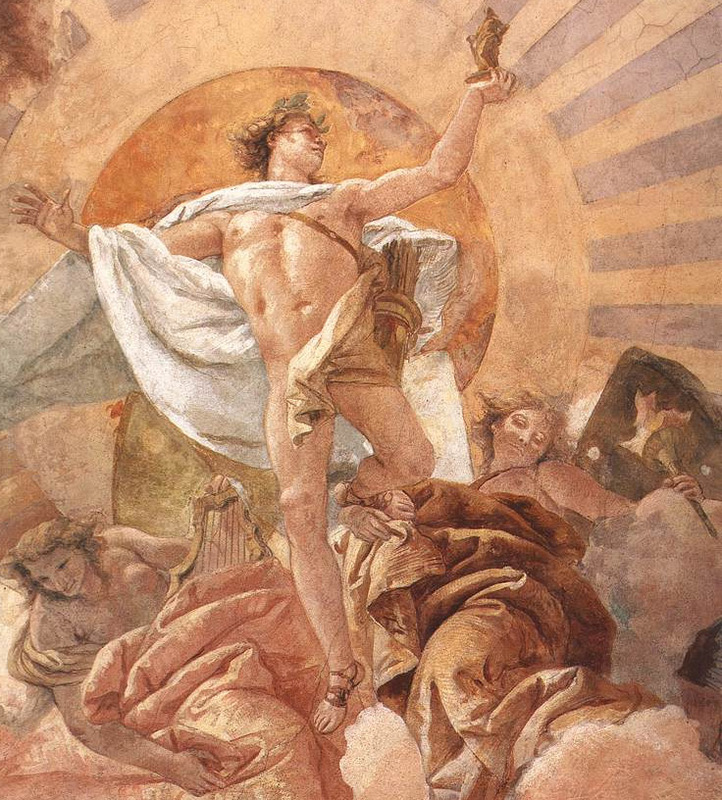 He is honoured by the gods of Olympus, and Fame, personified by a woman holding his portrait aloft, while allegories of the four continents cluster around, all serving as a device to show greater aerial perspective and depth and the dramatic effects of colour and movement. Tiepolo apparently intended Europe to symbolize the unity of the arts, cleverly incorporating portraits of himself, the architect Neumann, and the sculptor Benigno Bossi.